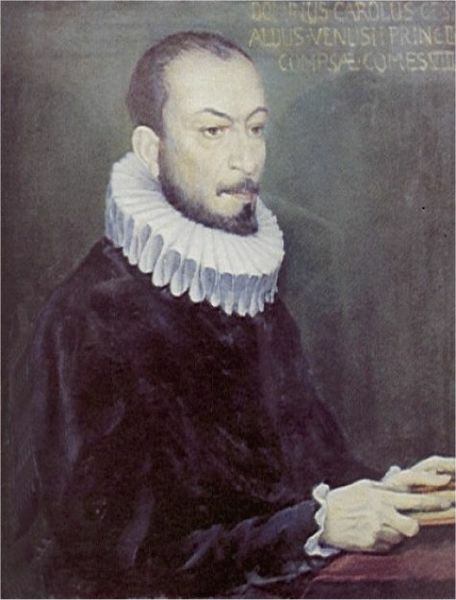 Don Carlo Gesualdo was an Italian Prince in the Renaissance. He was born into one of the richest families in Naples and married the most beautiful woman in the south of Italy. Unlike most aristocrats of his day, he was a virtuoso musician and composed beautiful and expressive music, but there was also a darker side to his character. Catching his wife and her lover red-handed, he brutally murdered them both before fleeing to his hilltop castle. There, in the courtyard, he had his youngest son whose parentage he now doubted, rocked to death whilst a choir sang songs about death. Travelling across Italy to Ferrara he encountered many new musical experiences and married again. He took his new wife back to his castle where a long abusive relationship was about to begin. Five years later, his mistress was tried for witchcraft. After being tortured, she confessed to poisoning the Prince, in quite disgusting ways, so that he would fall in love with her. She was locked up in the castle dungeon. Isolated from society, Gesualdo occupied himself with hunting and music. During his later life he developed masochistic tendencies and employed servants to beat him. Eventually, after the tragic death of his son in a freak riding accident, he locked himself in his music room, where he would spend the remainder of his life. Gesualdo’s own distinct personality found its way into his music and this makes it very exciting to study. His was extremely innovative and he wrote harmonies that would not be heard again for three hundred and fifty years. What makes this so interesting is that the music was written before we had our system of scales that we use today and call ‘The Tonal System’ but was written using earlier music theory the ‘Modal System’. This system did not develop in such a way that it can explain how Gesualdo’s music works and this is what my research sets out to do. Understanding how music was written and how people react to it is crucial for society. Everybody reacts to music, however diverse the reactions may be, and Gesualdo always provokes a response. Unravelling the creative processes behind his compositions is crucial for creating new music and throughout the last century many composers have found inspiration in the Prince’s works. Not only does his life make the plot of a good opera, there have been ten so far, but his forward looking nature provides inspiration for the generation of new music. In fact, I began studying Gesualdo as a composer. Gesualdo’s life and music are both extreme. They continue to drive new composition and research. Taking the music to pieces to see how it was made is an integral process in understanding how his music reacts with society. When it is as radical as Gesualdo’s, this relationship becomes even more exciting and is the motivation for my research. For more information, visit http://www.gesualdo.co.uk or e-mail me a question!